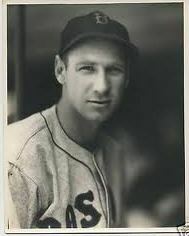 His was a career that saw him a contender for rookie of the year in 1936, his first full season with the Boston Red Sox. The “Rookie of the Year” designation wasn’t an official one until both The Sporting News and the Baseball Writers Association of America began selecting honorees right after World War II, but sportswriters naturally shared their thoughts on the subject. Though Kroner was a candidate for the informal nod, by season’s end one Joe DiMaggio had pretty convincingly laid claim to the title. Johnny Kroner never had another season approaching his first full year, always a victim to the role of the utility player, unable to edge his way into becoming a first-string player. He nonetheless enjoyed a career running from 1928 through 1942, appearing in 223 big-league games and 1,297 games in the minors. John Harold Kroner began and ended his life in St. Louis, born on November 13, 1908. His paternal grandfather came from Germany; his grandmother was a native of Missouri. John’s father, also John, worked for a milk company, as a driver at the time of the 1920 Census and a salesman in 1930. His mother, Jennie (Jeannette Pelzer) Kroner, didn’t seem to be on the scene in 1920; when John was 12, his father’s wife, Hazel, was said to be 22, presumably a second wife. Johnny attended Meramec school for eight years and Cleveland High School for two, worked for a while as an automobile mechanic, played baseball in St. Louis Muny league games in and around St. Louis, and attended the College of Pharmacy. He first got into Organized Baseball with Moline (Class D Mississippi Valley League) at the age of 19, playing in 57 games at shortstop for the Plowboys in 1928. He hit for a .241 average, with three home runs – fairly typical production for the position at the time, when defense was the most highly rated attribute of the shortstop. Kroner played third base in 120 Western League games for the Oklahoma City Indians in 1929 (marrying Virginia Nehoul in February), and 151 for the Indians in 1930, batting .285 and .279 respectively in Class A, with 10 homers in 1930. During the 1931 season, he moved up to the American Association’s Double-A Indianapolis Indians near the end of the year, acquitting himself well enough. He saw duty in only 80 games in 1932, split between the Clkass B Three-I League (Illinois-Indiana-Iowa) with the Terre Haute Tots (.276) and Indianapolis, where he hit for an impressive .344 at the higher level. His season shortened to due unspecified sickness, he missed all of 1933 as well. He played a full season with the International League’s Baltimore Orioles in 1934, batting .286. He really served notice in 1935, spending much of the season with the Syracuse Chiefs. He had played third base consistently, ever since his initial year in 1928. Syracuse was a good showcase. Kroner hit .323 in 1935, with 15 home runs. He had begun the year with Baltimore, but had to battle Eddie Mayo for the third-base slot. Though he’d played in 126 games in 1934, he hadn’t been the Orioles’ first choice. The Sporting News wrote that Kroner had “turned in fine work at this base while acting as utility infielder, and even if Mayo does eventually win the third sack job, Johnny will be retained for reserve infield work. He can play third, short, and first.”  The Chiefs placed second in the standings, but manager Nemo Leibold led the team to ultimate victory in the league playoffs. In one 1935 game, Kroner set a league record, handling 13 chances at third base. Syracuse swept the first round of the playoffs in four straight, Kroner hitting a grand slam in the 6-3 second game, and then edged Montreal in seven games in the finals. Kroner placed third (or fifth) in the International League MVP voting. In the meantime Kroner had had a brief taste of the big leagues, accorded him by the Boston Red Sox when he appeared in the last two games of the year – both games of a doubleheader in Yankee Stadium on September 29, the last day of the season. He was 0-for-4 with a walk and a strikeout in the first game, and 1-for-1 with a sacrifice in the five-inning second game. He had only one chance in the field, and he picked up an assist. He was sizable for the day – 6 feet tall and weighing 187 pounds. It wasn’t the first time Kroner had had a look at the majors. During the spring of 1934 he had been foreseen as one of three “doubtful reserves” for the Phillies’ infield, but he made it with the Red Sox instead and came back for a full year in 1936. Red Sox manager Joe Cronin saw Kroner as part of the team from the start: “John Kroner, a third baseman from Syracuse, hits the ball hard. He hits to left field regularly and probably would find the fence in Fenway Park a good target to shoot at. If Kroner improves in the field he may be an important cog in our 1936 machine.” It wasn’t the first time that Kroner’s less-than-stellar defense had been noted. Kroner started in the second game of the year and drove in two runs, but didn’t play again for two weeks. He appeared in eight games in May and six in June, filling in from time to time. He hit his first big-league home run on June 2, into deep left-center field at Fenway Park. He tripled off the center-field wall later in the game. In July he played in 20 games and never saw his average drop below .400; from June 27 to August 7, he stayed above the .400 mark, despite being shuffled around from third base to second base and to shortstop, “never knowing what job he is going to handle.” His work was noted, The Sporting News proclaiming, “Kroner has been a sensation. This Syracuse recruit, who warmed the bench for half the season, has only lately come into this own. Tried out at third at the fag end of a disappointing western trip, he established himself immediately with his war club and, more than any man on the team, he was responsible for the Sox sweeping that recent four-game series with the Athletics.” A later note acknowledged a real improvement in his fielding, and Kroner settled in at second base, with the word late in the year that he’d likely be tagged as starter at second in 1937. Kroner finished the season batting .292, with 62 RBIs, in 84 games. But things came together for the Red Sox, and the team put him on waivers just before the season began. Connie Mack of the Philadelphia Athletics held up the waiver process, but the Cleveland Indians noted his availability and stepped in, reaching out to Red Sox general manager Eddie Collins and offering an amount just above the $7,500 waiver price. The Indians’ general manager, Cy Slapnicka, announcing the acquisition on April 15. Cleveland planned to use him in the same sort of utility role as had the Red Sox. The season started very poorly, The Sporting News claiming, “Kroner performed so badly in his first few starts as an Indian that most of the fans expressed bewilderment that a player of such caliber ever reached the major leagues.” It got better, and he was hitting.333 by May 11, but came down with a serious enough case of hives that he remained in Cleveland rather than travel with the team. It wasn’t the first time the affliction had troubled him (a later story in The Sporting News unflatteringly called Kroner “the big hives man from St. Louis”; he rejoined the team on May 21 but didn’t appear in a game until June 3. Kroner’s defense had improved significantly: “He is already recognized as the Tribe’s best double-play man, whether on the initiating or the pivot end of the twin killing, Kroner makes the double-plays look easy.” He was used sporadically through July, but got in a heavy dose of duty in both August and September. He didn’t hit as well as in 1936; he finished the season with a .237 average and 26 RBIs in 86 games, but “Kroner’s batting average doesn’t tell the whole story. Many of his hits were timely, as well as powerful, but it was mainly on the defense that he helped the Tribe.” A day that wasn’t his best on defense came on August 30, when he committed two successive errors in the second inning, but he beat Washington offensively with a game-winning single in the bottom of the ninth. The sale to Syracuse was a move popular with Chiefs fans, who’d seen Kroner lead the team in home runs in 1935. He hit a middling .276 with only three homers in Syracuse in 1939. Just before the season began, Steve O’Neill – under whom Kroner had played for Cleveland in 1937, but who was now managing Buffalo – traded Roy Johnson straight up for Kroner. He played another full season for the Bisons, and hit only.238. In 1941 Kroner played most of the year in the Southern Association for the Knoxville Smokies, and at the slightly lower level hit for a .315 average; he had appeared in five games for Dallas at the very start of the season. He refused to report to Knoxville in the spring of 1942, but began to play in May, back with Oklahoma City. There he hit just .206 but served as one of four managers on the team that year. The team won its first six games after he took over as skipper, but after losing seven in a row, he was released on August 3 with an 18-32 record. Despite Kroner’s status as a registered pharmacist, he worked as a newspaper carrier for the St. Louis Post-Dispatch after his years in baseball. He died of respiratory failure due to emphysema on August 26, 1968, not long before he would have turned 60. In addition to the sources noted in this biography, the author also accessed Kroner’s player file from the National Baseball Hall of Fame, and consulted Retrosheet.org and Baseball-Reference.com. The Sporting News, October 3 and November 7, 1935. The New York World-Telegram reported Kroner in fifth place, in an AP story filed on September 10. The Phillies’ interest was noted in The Sporting News of March 22, 1934. Christian Science Monitor, April 9, 1936.The “hardest hitter” remark was Rumill’s, in a June 3 column.